Location: In the heart of Forest City, just east of Highway 69. Entrances off Highway 69 and East J Street. Facilities: 2 lighted baseball/softball diamonds, playground equipment, bike and walking trail, Winnebago River water trail , low impact canoe/kayak access, Lions Club memorial shelter, butterfly garden, camping area, dump station, and disc golf course(Course Map). Public restrooms. 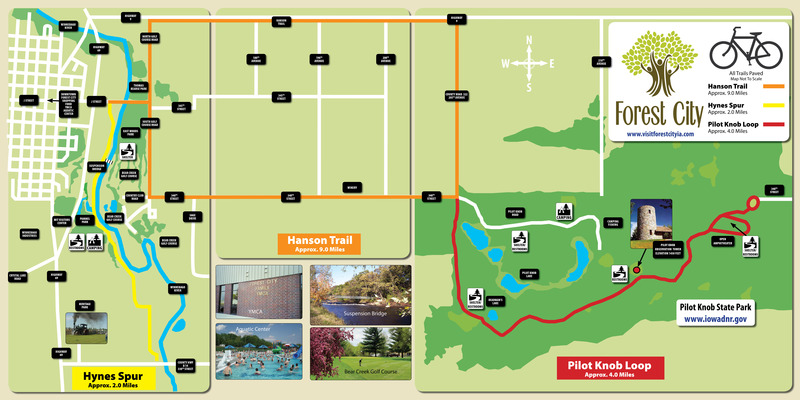 Facilities: 2 playground areas, 3 gazebos, 2 grills, shelterhouse, and disc golf course. Location: Use entrance to Eastwoods on East J Street (south side.) Follow trail approximately ½ mile. Facilities: Open shelter with water, electricity, restroom, 3-15’ picnic tables, fireplace, and playground equipment. Reservations are taken April 1 – September 30; contact the Forest City Parks & Recreation Department at (641) 585-4860. Fee $25 per day for reservation. Location: Entrance is off East J Street (north side), next to the Winnebago River, across from the entrance to Eastwoods Park. Facilities: Small parking area, picnic tables, gazebo, and sign commemorating Thomas Bearse as the first settler of Winnebago County. Facilities: 1 small slide, 1 large slide, 1 large climbing apparatus, 1 spring animal, 2 swing sets, 2 benches and 2 picnic tables. Shelter house with picnic tables and kitchen area. Location: north end of Gilbert Street in a residential area. Facilities: “Tot Lot” with playground unit, gazebo, playhouse, and swing set. Location: Neighborhood park located in the Westgate housing subdivision. Entrance is off of Westwood Court and Westgate Drive. Facilities: Playground equipment, gazebo, basketball court, and several benches. Location: Neighborhood park located in the Woodland Housing Subdivision. Facilities: 2 picnic tables, 2 benches, play unit equipped with 3 slides, a swing, and a log roll. Location: On Clark Street, across from Winnebago County Courthouse. Facilities: Two benches, handicapped accessible walkways, two picnic tables. Location: John K. Hanson Drive across from the Waldorf College football field. Location: Secor Avenue and Hwy 69. Facilities: One picnic Table and a grass area for picnics and play. The Forest City Parks and Recreation Department continually strives to maintain, improve, and expand the trail system, in order to reach and better serve the growing residents and visitors. Hynes Spur Trail – Approx. 2 miles from J Street at Pammel Park to 330th St./Airport Road. It meanders through Pammel Park, a woodland setting, through the Bear Creek Golf Course and Disc Golf Course and past the Winnebago Rally grounds to 330th St./Airport Road. All off road paved trail. Hanson Trail – Approx 9 miles. Begins at on J Street next to Pammel Park entrance, left on Golf Course Road to Hwy 9, East along Hwy 9 to 206th Ave. to Pilot Knob Entrance, West on 340th Street to Golf Course Road and Left on J Street to Pammel Park entrance. A combination of paved off road trails and share-the-road trails. Pilot Knob Loop – Approx 4 miles. Begins at the entrance of Pilot Knob State Park and winds through the park. All paved and on park roads.